Wool carpeting is a beautiful addition to any room, and is a great way to add value and comfort to your home. 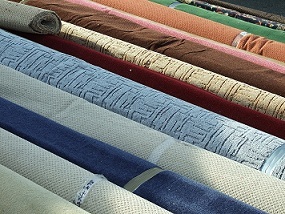 Unfortunately, it’s impossible to prevent dirt and stains from getting onto your carpet, and wool carpeting is very durable, but can still be harder to clean than some synthetic carpets. Often made with natural dyes, wool carpeting is easily damaged by harsh cleaners. Taking care of a stain quickly, and correctly, will help preserve your wool carpets for years to come. Acting quickly is the number one way to prevent stains from sticking. For liquid stain removal, gently blot up as much liquid as possible with a clean, white paper towel or rag. Continue gently blotting the area until the stain has been removed. For stains like chocolate or chewing gum, place an ice cube on the chocolate until it is frozen. Then gently pick off the frozen chocolate or gum with a knife. Make sure that you find a stain treater that is safe for wool carpets, and that will not bleach or discolor the carpeting. Test any new cleaning products on an area of the carpeting that no one will see, such as inside of a closet. If you’re not sure of the best way to treat a strain on a wool carpet, it’s best to call a professional. Taking proper care of your carpeting will not only extend the life of the carpets, but will increase the value of your home.